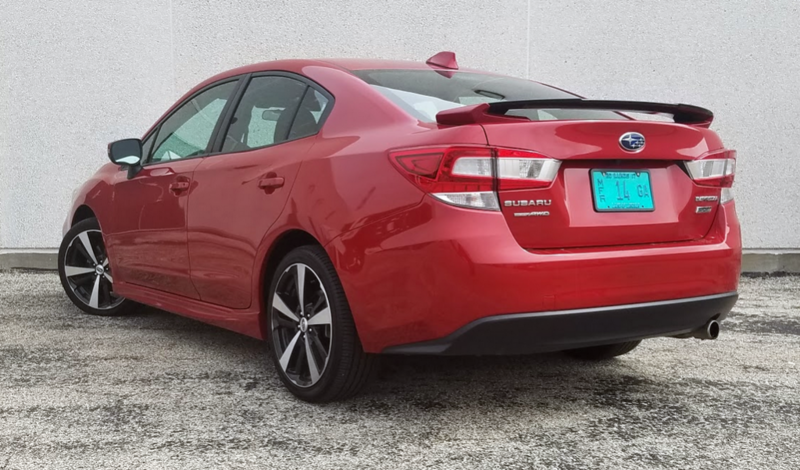 Even if you don’t think the Sport model of the latest iteration of the Subaru Impreza is “sport” enough, you’ll probably have to admire the price. The all-wheel-drive compact sedan—a bit bigger and more powerful than before—starts at $21,995. 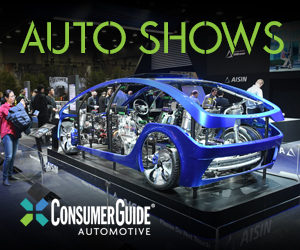 With a bit of desirable equipment and destination folded in, the one that Consumer Guide® editors tested came in at $26,560. The Impreza 2.0i Sport model’s main exterior features are 18-inch alloy wheels and a rear decklid spoiler. Before you spend an extra dime, the 2017 Impreza Sport comes with a 2.0-liter “boxer” 4-cylinder engine, sport-tuned suspension, 18-inch alloy wheels, active torque vectoring, heated cloth front seats, heated exterior mirrors, aluminum pedal faces, keyless access, push-button starting, a multifunction information display, rearview camera, leather-wrapped steering wheel and shifter handle, contrast stitching, simulated carbon-fiber dash and door-panel trim, decklid spoiler, Starlink infotainment displayed on an 8-inch touchscreen, Apple CarPlay and Android Auto connectivity, hands-free telephone and text capability, voice controls, satellite radio, and Starlink apps and connected safety services. CG’s test car added a continuously variable transmission (in place of the base 5-speed manual); moonroof; Harmon Kardon audio (an upgrade over the standard 6-speaker AM/FM/CD unit); and Eyesight driver assists including adaptive cruise control, automatic precollision braking, lane-departing warning and lane-keeping assist, blind-spot detection, and rear cross-traffic alert. The Impreza 2.0i Sport’s interior is nicely executed, especially considering the price point. The cloth upholstery looks nice and feels sturdy, and sporty touches such as aluminum pedal covers, leather-wrapped steering wheel and shift handle, red contrast stitching, and simulated carbon-fiber trim inserts add visual appeal. The redesigned ’17 Impreza has lengthened wheelbase by an inch and slightly increased exterior dimensions, too. The naturally aspirated 2.0-liter engine with direct injection makes 152 horsepower, a gain of four. 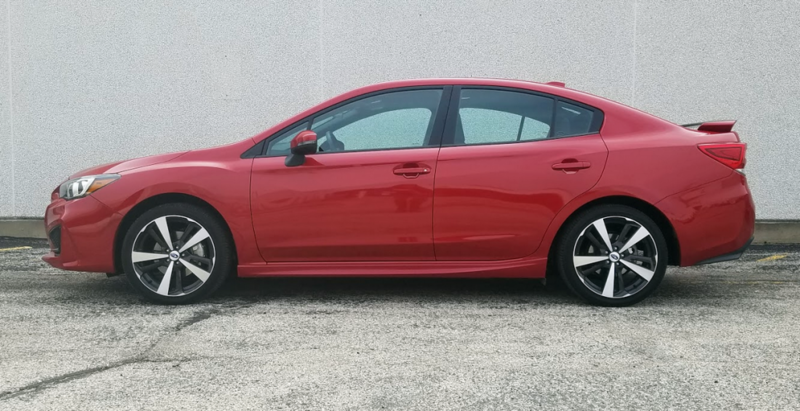 It’s the only engine provided in Imprezas, and while it might be fine for other models in the lineup, it doesn’t seem like much for a car that calls itself Sport. With modest torque output (145 lb-ft at 4000 rpm) the powerplant doesn’t exactly blast the car off the line even if it does make for eminently capable highway cruising. In CVT-equipped cars, drivers can try to improve their experience by working the steering-wheel-mounted paddle shifters. EPA fuel-economy estimates for the test car were 27 mpg in the city, 36 on the highway, and 30 combined. However, this driver clocked just 24.51 mpg after driving 146.9 miles, 72 percent of them in city conditions. 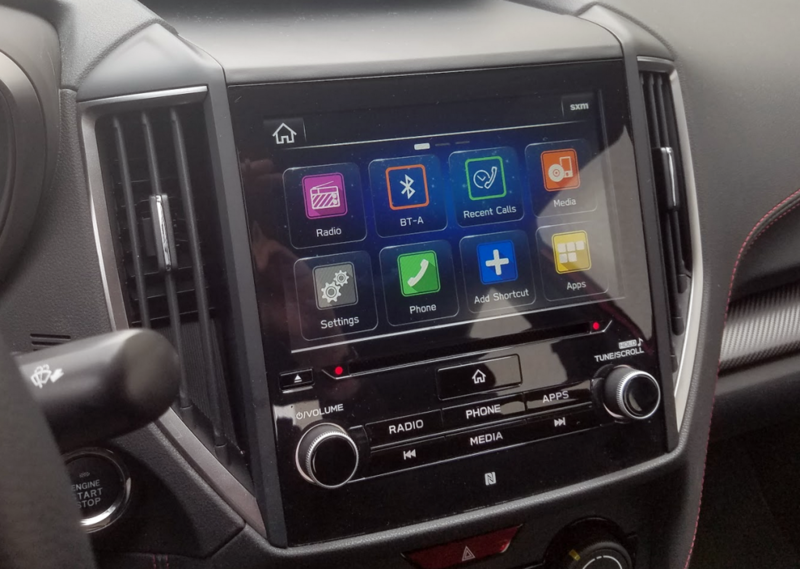 The 2017 Impreza’s new STARLINK 8.0 infotainment system is a big improvement over previous models. It features crisp, clear graphics; large, easy-to-use icons; and a good selection of up-to-the-minute features. This driver liked the Impreza Sport‘s steering response. Also on hand to assist handling is the torque-vectoring system that increases stability through fast turns. Even with the tweaked suspension, ride quality still remained fairly supple. There was a sense of solidity over bumps, too. Subaru says the body structure of the new Impreza is more than 70 percent more rigid than before, and the test car certainly didn’t wiggle or rattle to any great degree over road-surface imperfections. The larger package opens up a little bit more rear-seat legroom. Indeed, the new Impreza is pretty good in that department for the compact field. Furthermore, three adults could conceivably fit across the rear seat, though the middle rider wouldn’t enjoy as much headroom as the passengers in the outboard seats get. There’s a roomy feel up front, and driver vision is great, thanks to fairly slender roof pillars. As for ambience, there is some barely spongy material on the upper half of the dash panel and the front doors. (Rear doors maintain the look but without any underlying give.) Soft-touch materials are found on the door centers and armrests. The consistently black look of the test car’s interior was relieved a bit by the subtle red highlights sewn into the seats, steering wheel, and other areas. Audio and climate controls are easy to use. Locking in radio presets requires nothing more than finger taps on the screen because separate tuning and volume knobs are provided. Three dials let users get right to the climate settings they want. Meanwhile, personal-storage space is just OK. There’s a decent enough glove box but a smallish covered console box, pockets with bottle holders in front doors, much smaller pockets with bottle holders in rear doors, a storage pouch only on the back of the right-front seat, and no pull-down armrest in the middle of the rear seat, which means no cup holders. (Two exposed cup holders are in the console for use by front passengers.) An exposed bin at the front of the console contains USB and auxiliary ports. 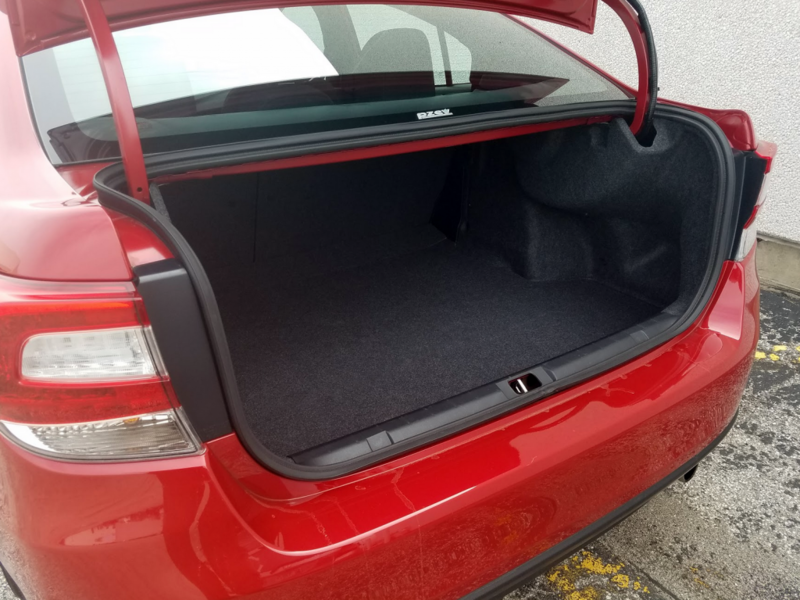 Despite a “short” decklid length, the Impreza’s trunk has a decent-sized opening that makes it easy to load large items, and overall space is class-competitive. A wide trunk opening improves the ease of cargo loading. There’s a good amount of space on the flat trunk floor, and a tiny bit of room for a small item or two under the floor. Rear seats fold in a 60/40 split. 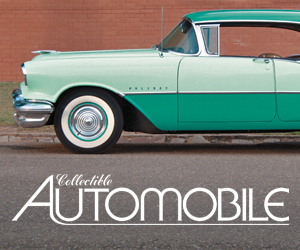 The seat backs fold flat, but at a slight height above the level of the trunk floor—though a panel of trunk-lining material makes the transition smooth. If your concept of “sport” in a car involves tire-smoking muscle, this Subaru is not your favorite Sport. If, however, you define it as pleasurable to drive while still being easy to afford, then this Impreza gets you into the game. 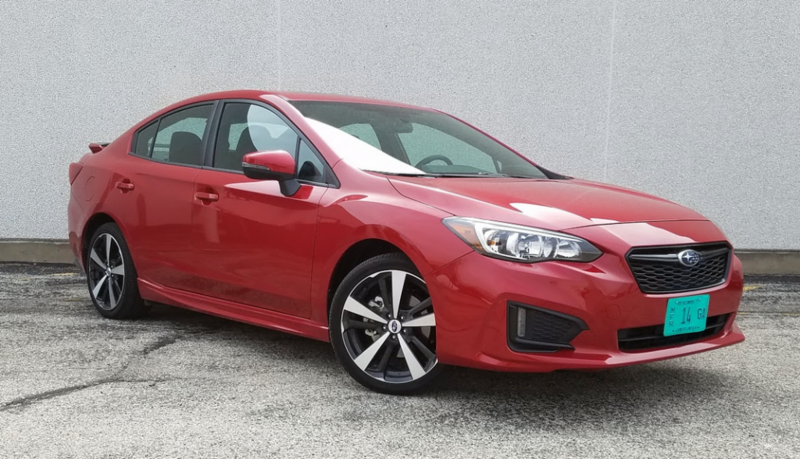 At an as-tested price of $26,560, the 2017 Subaru Impreza 2.0i Sport delivers a good number of features for the money. It’s a fine compact-car value, particularly if you need the all-weather versatility of all-wheel drive. Written by: The Daily Drive staff on June 2, 2017.on June 5, 2017.